The Pixie Acoustic-Electric guitar is a full-scale instrument designed especially for girls. 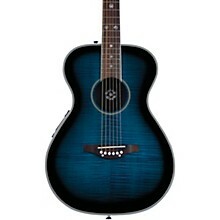 This beautiful guitar is lightweight and sounds great. It features Daisy Rock’s trademark “Slim & Narrow”, neck which makes it easier for girls with smaller hands to play. The Pixie Acoustic-Electric guitar highlights innate femininity, uncompromised quality and even has a built-in electronic tuner for your convenience. This guitar produces a rich tone, and its slightly smaller-sized body fits girls just right. It also includes a Daisy custom piezo preamp/pickup system so you can plug into an amp, crank it up and rock the stage. All Daisy Rock guitars arrive setup, ready to play, and are backed by a limited lifetime warranty. 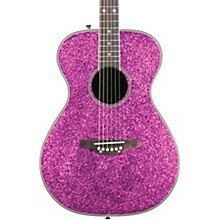 Order Pink Sparkle, Plum Purple Burst, or Raspberry Burst finish. Weight: 4 lb., 12 oz.